I look forward to most of the assignments I get from The New York Times. Naturally, they do stories on interesting things and people and because I shoot primarily for the Dining & Wine and Home & Garden sections, I’m almost always guaranteed to get gigs I’m interested in. But sometimes one comes along that I’m not just interested in, but really, really excited about. When the picture editor for the Home & Garden section contacted me last fall about a story in Harborside, Maine, I knew right away who the subjects were before she even told me. “Sounds like it must be Eliot Coleman and Barbara Damrosch,” I wrote. “That’s exactly who it is!” she replied. 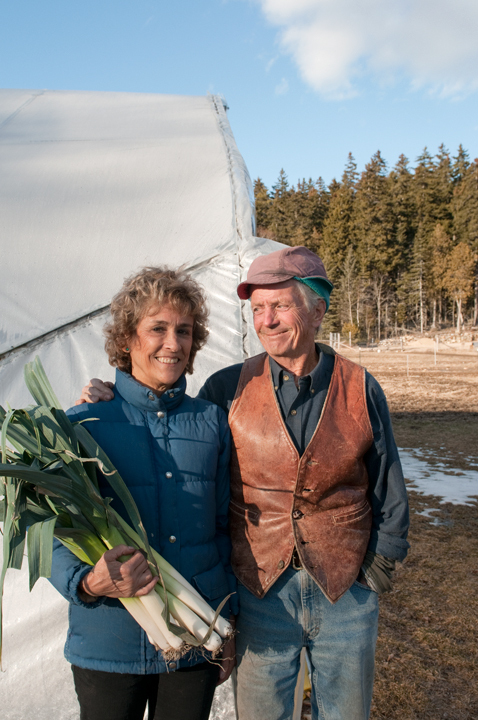 Well, almost everyone who has been gardening, especially in Maine, for any length of time, has heard of this organic gardening powerhouse couple. Damrosch’s Garden Primer, a grower’s bible, sits tattered and soil-stained on many a bookshelf, including mine. And Coleman’s recent books on extending the growing season into the winter have changed the landscape of growing in colder climates. His contributions to organic gardening go on and on; just flip through a Johnny’s Selected Seed catalog and see how many times his name is mentioned as a developer of ground-breaking (sometimes literally!) farming tools. Coleman prepares a bed for seeding with one of the tools he invented, the tilther, which is powered by a rechargeable drill. So, as an avid home gardener, and year-round supporter of organic farms, it was with great enthusiasm and anticipation that I drove down the long, windy road to Cape Rosier, about three hours northeast of Portland in early February to take the photos for this article on winter growing. This is storied territory; the legendary back-to-landers Helen and Scott Nearing lived here. Greatly influenced by their book Living the Good Life, Coleman sought them out in 1968 and purchased land from them on which to farm and live. 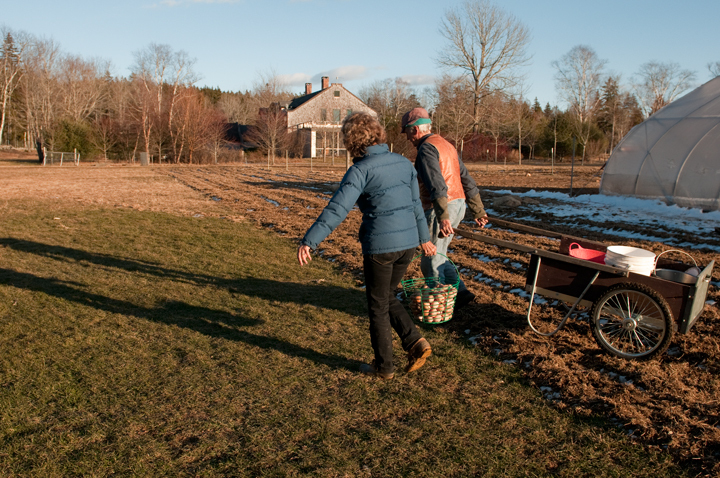 Over the decades, what is now called Four Season Farm has grown into a tidy compound of greenhouses, barns, root cellars, a farmstand/art gallery and housing for Coleman, Damrosch and their seasonal workers. 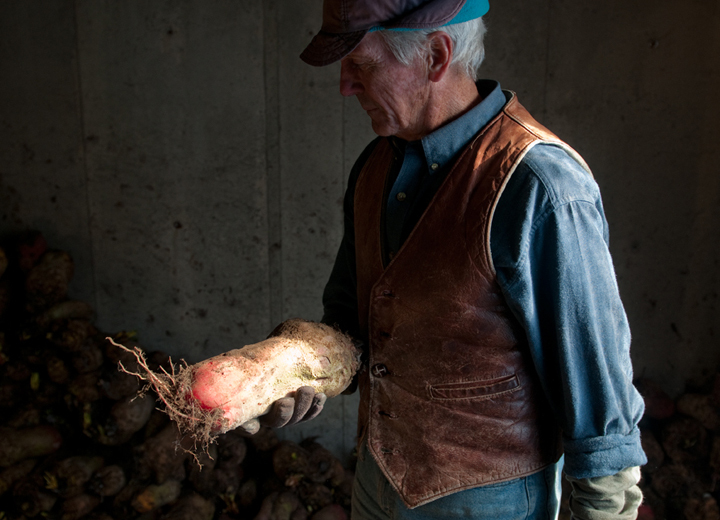 In one of three root cellars on Four Season Farm, Coleman holds a mangold, which is a giant beet that they use as feed for the chickens. Although Mother Nature did not cooperate by providing the snow cover Maine is so often associated with in this season, there were plenty of scenic shots to be had. Greenhouses filled with leeks, onions, carrots, spinach and other greens were a sight for storage-vegetable-saturated eyes (and bellies). Coleman told me that even after all these years of winter growing, he is still filled with child-like excitement when he unfurls a row cover and sees green in the middle of winter. I know the feeling, though on a much smaller scale. My husband and I put some spinach seeds in a small, covered raised bed in late fall one year and the next spring opened up the cover to find big, beautiful spinach leaves. We were truly amazed as we didn’t really think anything could survive the Maine winter outdoors! Now it is our practice to plant spinach in October for an early spring harvest of sweet, green leaves. A bed of spinach that was planted in the fall continues to grow through the winter in an unheated greenhouse on the farm. Damrosch harvests tatsoi, a hardy Asian green that is growing in a glasshouse attached to their home. Damrosch is an accomplished cook (with a cookbook coming out next year) and after a couple of hours roaming around the farm happily photographing the winter bounty, I was lucky enough to partake in a lunch she prepared that was filling enough for a farmer plowing fields all day long. 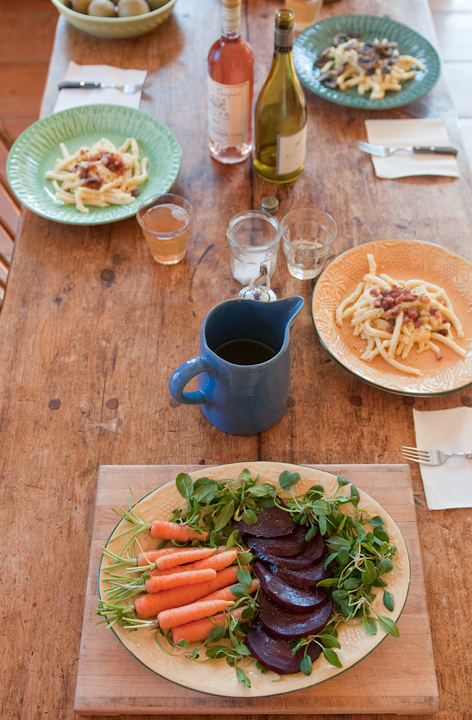 The highlight was a platter of Four Season Farm beets, carrots and spinach thinnings. And what a treat it was just to sit at a table with these two stalwarts of organic growing, eating beautiful food and enjoying good conversation, their love of their lives and work—which are really one in the same—readily apparent. Not that they aren’t incredibly busy and I’m sure, at times, stressed out, but they seem to be possessed of an energy more often found in people decades younger. Lunch fit for a farmer. Damrosch and Coleman: clearly a couple that was meant to be! 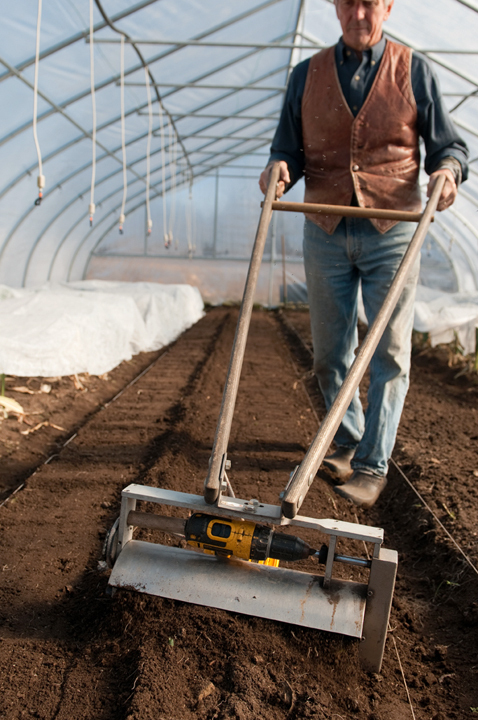 After lunch, Eliot, who is 73, got right back to work preparing a row in one greenhouse for seeding carrots and then sowing the seed. 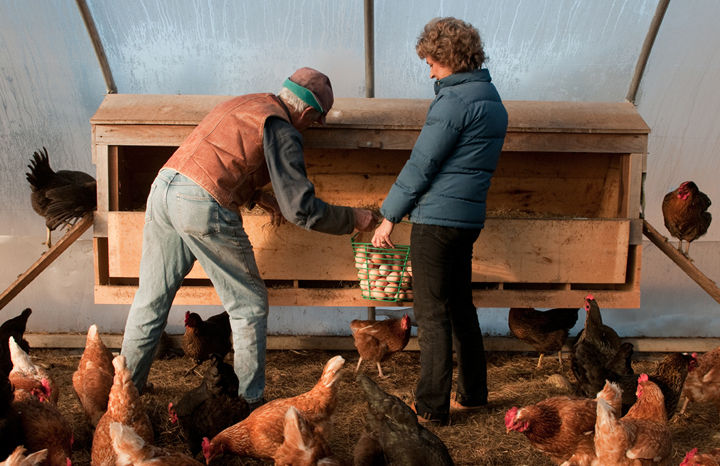 Then dozens of eggs needed to be collected, washed and packaged for sale. In peak growing season, I can only imagine how much more there is to keep track of. I left feeling completely impressed and inspired by how hard these two work and all they have accomplished. How they live their lives is laudable, but even more noteworthy is how they’ve empowered others to live the good life too. Not everyone can have multiple acres to grow food on, nor the time to tend to it, but certainly incorporating small bits of what Damrosch and Coleman do into one’s own life is possible in many cases. 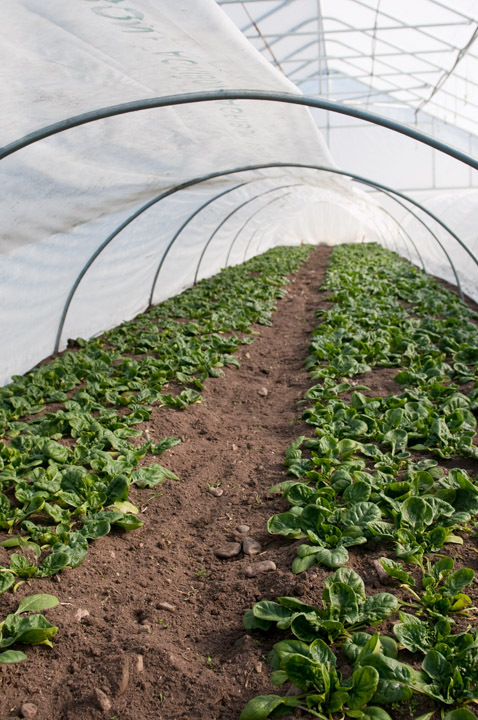 Despite living on tenth-of-an-acre plots in suburban South Portland, after this article came out, a neighbor and I started discussing how and where we could build a little greenhouse to extend our short growing season. Maybe by next spring our tiny winter spinach-growing project will have blossomed into one that can keep at least four people in fresh organic greens through the winter! Heading towards the barn at day’s end. 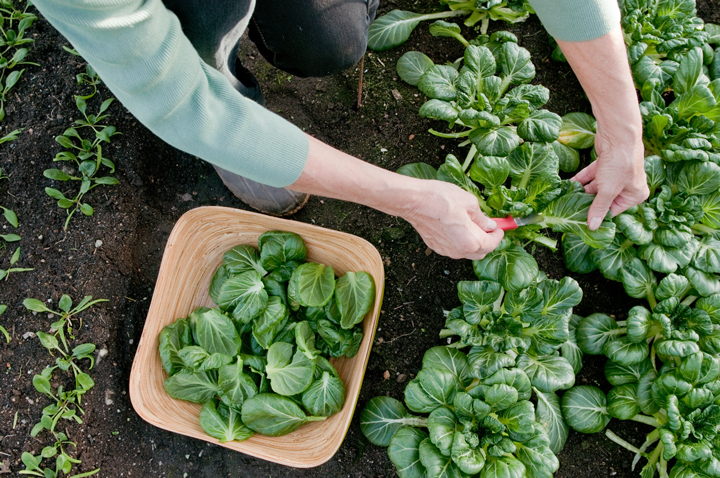 This entry was posted in food, gardening, The New York Times and tagged Barbara Damrosch, Eliot Coleman, Four Season Farm, Harborside, hoop houses, organic farming, winter growing on March 2, 2012 by Stacey Cramp.